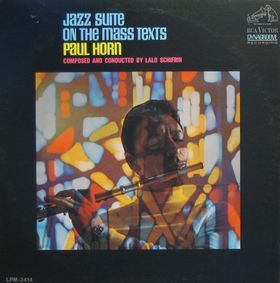 A piece of music played by jazz specialist Paul Horn with music composed and conducted by Lalo Schifrin, the material present brings both the classical and jazz genres together, blending it further with the magic and mystery of the hymns of the church. The music at times is structured and arranged for the listener to enjoy with ease and relaxation. Though one point of the record is its method of tension and release, present during the far more abstract parts of the record, such as at the very climax of "Credo." The music here is a reflection of the church, using a broader base of textures and colors in jazz. The dynamics are powerful in this performance, and the communication between Horn's quintet, the orchestra led by Lalo Schifrin, and the chorus is undeniably magical. Certainly much of the record can be found leading into the realm of experimental music, and the critical listener should not be so critical, but rather sit, enjoy, and open their mind and listening senses. By Shawn M. Haney, All Music Guide. One of Paul Horn's groovier albums from the 60s -- and a record that features some nice arrangements by Lalo Schifrin! As the title might make you guess, the album's kind of a "jazz mass", and replicates the Kyrie, Gloria, and Offertory progression of a regular Catholic mass. The whole thing might be pretty snoozy, but it's fortunately saved by some nice playing by Horn, and by groovy elements in Schifrin's arrangements, particularly the percussion playing of Emil Richards and Milt Holland.